There are rumblings that one of the greatest heavyweights to compete in the sport of mixed martial arts may finally be coming to the UFC. It has long been the dream of Dana White, Lorenzo Fertitta, and just about every fan of the sport to one day see “The Last Emporer” inside the Octagon. There have been rumors that a major announcement was imminent on Fedor Emelianenko (34-4, 1 NC) joining the UFC, and we will hopefully hear something soon, as Fedor will be turning 39 years old at the end of this month and he may not have many fights left in him. 5.) Frank Mir: This would be a big test for Mir and Emelianenko as well. Mir has been on a nice career comeback with impressive back-to-back TKO wins. With Mir facing Arlovski this Saturday at UFC 191, another win would push Mir closer to a last chance for a title shot. Mir would need one more “key win” and who else than a big win over a legend like Fedor? Now for Fedor, this fight would also be key if Mir emerged victorious. Emelianenko would be squaring off a top 10 heavyweight with (potentially) an impressive three-fight winning streak. 4.) Andrei Arlovski: These two fought back in 2009 for the now defunct Affliction. At the time, Arlovski was seen as the man who could “dethrone” the “Last Emperor”. Fedor thought differently, catching Arlovski with a vicious knockout following a botched flying knee attempt by “The Pitbull”. The first three minutes of the fight were rather entertaining, and Arlovski could have had more success in hind-site if he did not make a wrong move which Fedor capitalized on. Arlovski is on a nice career rebound much like Mir, and has won three straight in the UFC. If Arovski would win, like Mir, a win over Fedor would be instant title shot, and the same for Fedor. 3.) Stipe Miocic: Miocic is the 3rd ranked heavyweight in the UFC, and had a nice winning streak at hand with a potential title shot all taken away from a decision loss to Junior Dos Santos back in December. Miocic would rebound with a very impressive 5th round TKO over Mark Hunt. Miocic is scheduled to fight Ben Rothwell in October’s UFC Fight Night 76 in Dublin, Ireland. If Miocic defeats Rothwell, he may be up for a title shot, or possibly “one more win”. If he doesn’t get the nod for a title fight, Miocic vs. Emelianenko would make for an entertaning scrap and story line. Emelianenko did defeat Miocic’s mentor, Mirko “Cro Cop” Flipovic back in the Pride era. 2.) Cain Velasquez: This would be a very tough “return” fight for Fedor right off the bat. Velasquez is a solid wrestler with heavy striking. At the same time, Fedor is no stranger when it comes to dropping bombs. This fight could potentially not even make it past the first round. Velasquez would like for an immediate rematch against Fabricio Werdum to win back the heavyweight title. Werdum is currently taking a break (perhaps waiting for Fedor’s great arrival?) and Velasquez is free at the moment. This fight was always a top speculation by mma fans on who would win, Velasquez or Fedor? We may soon find out. 1.) Fabricio Werdum: Since rejoining the UFC for a second stint, Werdum has been one of the best all around fighters in the game. Werdum was always a phenom on the ground, and pulled one of the biggest upsets in the history of mixed martial arts when he was the first ever to submit Fedor Emelianenko back in June 2010 at Strikeforce/M-1 Global. The loss to Werdum would be the start of a three-fight skid for Emelianenko, and talks of how the “G.O.A.T” has fallen. Emelianenko would rebound from the losing streak, winning his final three fights in a row, and then retiring from the sport. 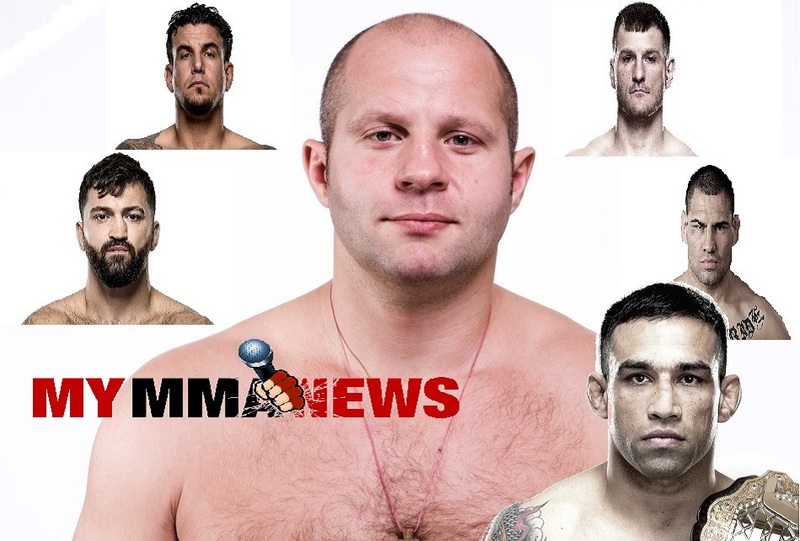 Emelianenko would love the opportunity to avenge his loss against the fighter who stole his “aura” in Werdum. This fight would be great to see five years later, as Werdum has now greatly improved on his stand up game as well, and as mentioned earlier, has been undefeated in his return in the UFC (6-0) and now the king of the heavyweight division.